Well, this is rather late but I have been super busy posting other things and trying lots of delicious food. Work has been quite crazy as it’s peak season so my weekends have involved minimal thinking and as much countryside as I can too. I have been craving the outdoors lately but I love it! So what happened in February? A little bit by the looks of it. I try and keep these posts as short as I can but sometimes there are just too many things I wanna share. I do these instead of posting full reviews and to help people find some local places to visit. Thanks for reading anyway and hopefully you will be inspired to try somewhere new after this! I don’t know if you know but Pho is really good for those who are gluten free. 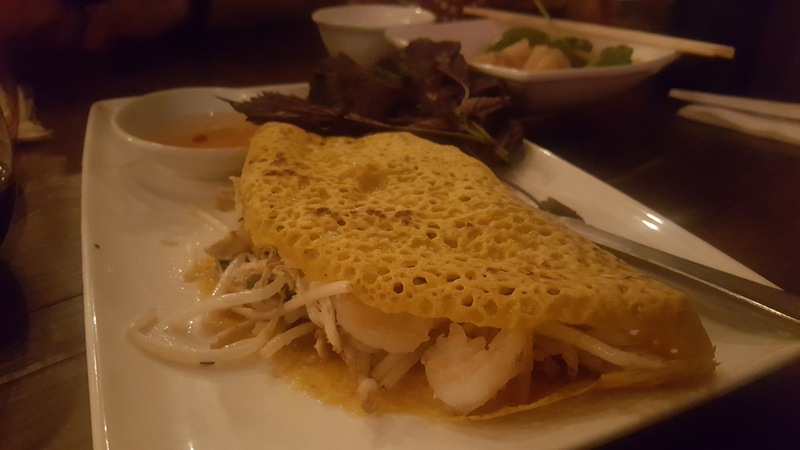 I think about a year ago they changed up their menu and enjoyed one of my favourite Vietnamese dishes the Banh Xeo pancake. I learned how to make it in my cookery class in Hoi An Vietnam and wrote an adapted recipe which you can read here and try and make it for yourself at home! The Pho version is good, you are served rice paper to eat it with, plenty of herbs, and there are juicy prawns inside and crunchy beansprouts too. I think Pho do a great job and although some of their dishes are not quite as authentic as you would find in the bustling streets of Ho Chi Minh or Hanoi, they still taste pretty bloody good. Their salt and pepper squid is also gluten free and it’s blimming yum. Try it! Last year Daz and I went on a holiday to Greece with some friends and in Feb we decided to have a reunion. I asked Twitter where everyone’s favourite Greek place was in Brighton and Estia came up many times. I booked us in and it was great! 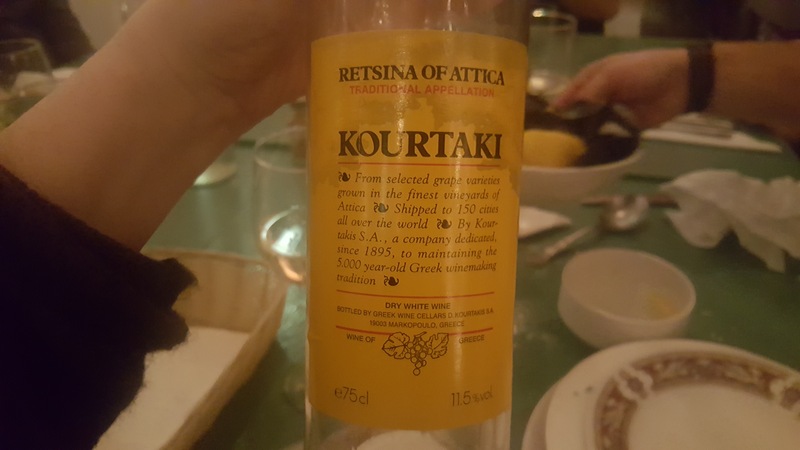 The pic above was of a Greek wine for around £9.50 and it was really good. Me and Daz shared the seafood meze platter which was £15.95 each (bargain) and included: Warm Pitta Bread, Dressed Olives, 3 Dip Selection, Grillied Halloumi Cheese, Lemonata Mussels, Calamari Rings, King Prawns, Greek Salad, Fried Potatoes and Grilled Swordfish and when I asked if they did gluten free pitta bread she said they can go and buy some and she did! It’s family run and owned which made it feel warm and homely and the service was nice and friendly too. 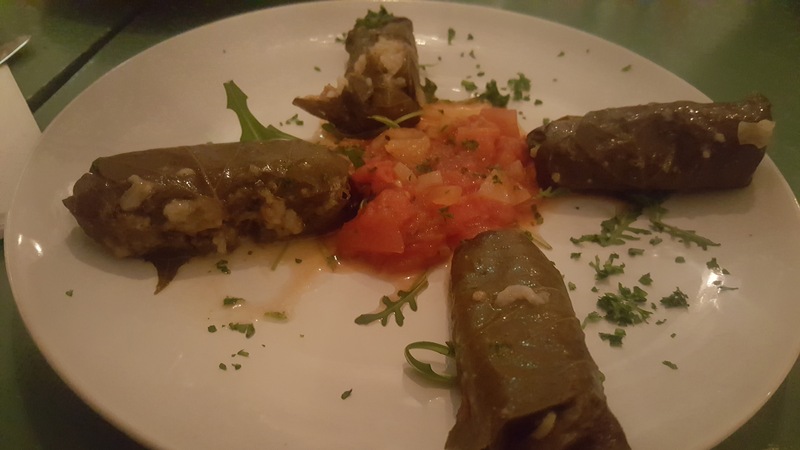 I also ordered some dolmades as pictured above and they were some of the nicest I have had! I would definitely recommend it. After dinner we went to the Cocktail Shack (I convinced the boys it was the right idea as it was close by and has a table tennis table downstairs). They had recently renovated it and switched the bar around so it was a bit confusing to get in, but the lovely staff at The Set were friendly and helpful to guide us through. The staff at the Cocktail Shack were a little cold towards us though and I felt like we weren’t cool enough to be in there which sucked. I have been numerous times before and the staff are usually super friendly and welcoming but I didn’t recognise any of the staff on that night and it put me off a little. 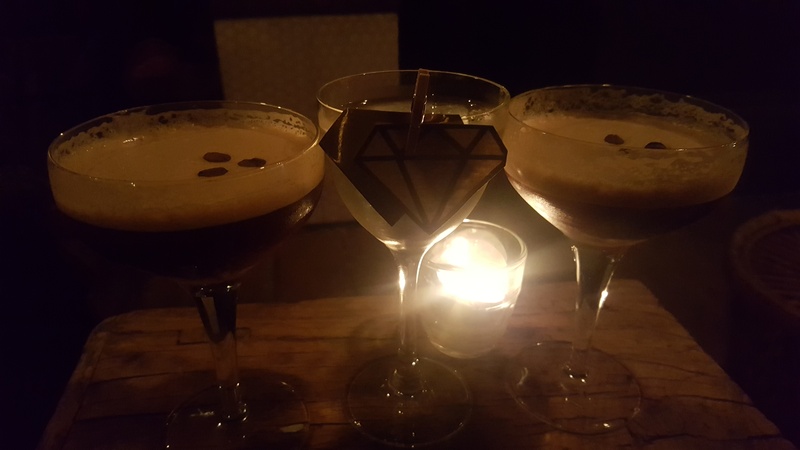 That was until we discovered The Curious Mr Hanbury bar hidden behind the bookcase downstairs… The staff here were lovely and welcoming and I would definitely be back again soon. After purchasing my Instant Pot I was on the hunt for some good new recipe websites or blogs. Since discovering paleo eating I had found and loved Nom Nom Paleo and still use her recipes for inspiration most of the time as they always really tasty. I recently came across Pressure Cook Recipes and I have become obsessed! It is created by a couple that test and test the recipes until they are perfect and then post in lots of different ways so should suit everyone. 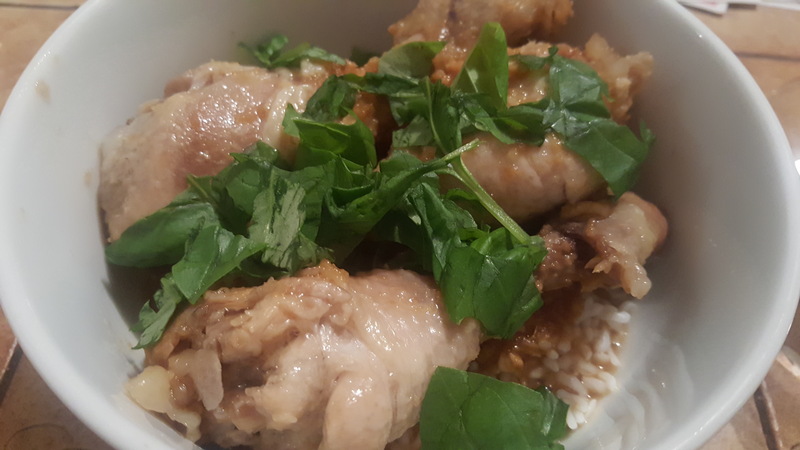 The pic above is a Taiwanese 3 cup chicken recipe and it was so delish. I have made it a couple of times since as it’s so good! If you love garlic and ginger it’s one for you. These were some naughty snacks at the Hare and Hounds from their starter/bar snack menu. 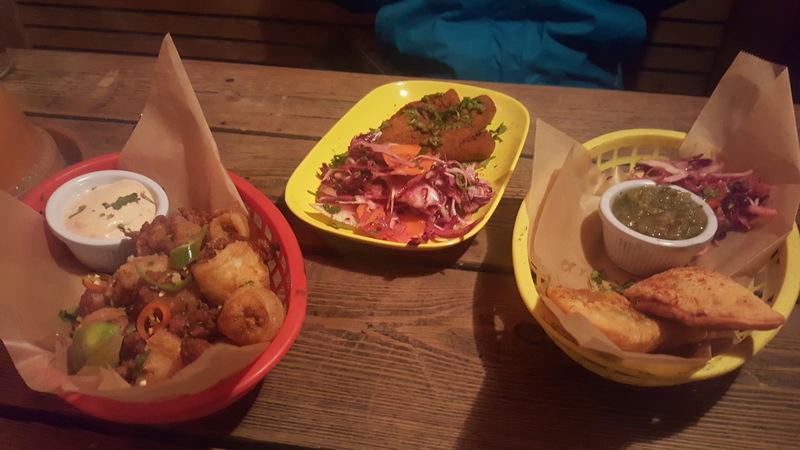 The squid comes with chipotle mayo and lime and is really more-ish, next to that were the crab croquettes which were okay, nothing too exciting and then the dish on the right were beef empanadas and they were lush! They came with a tomatillo salsa that was nice and spicy and the filling was plentiful. I think they were on special so you might not be able to get them again but their specials are worth giving a go! 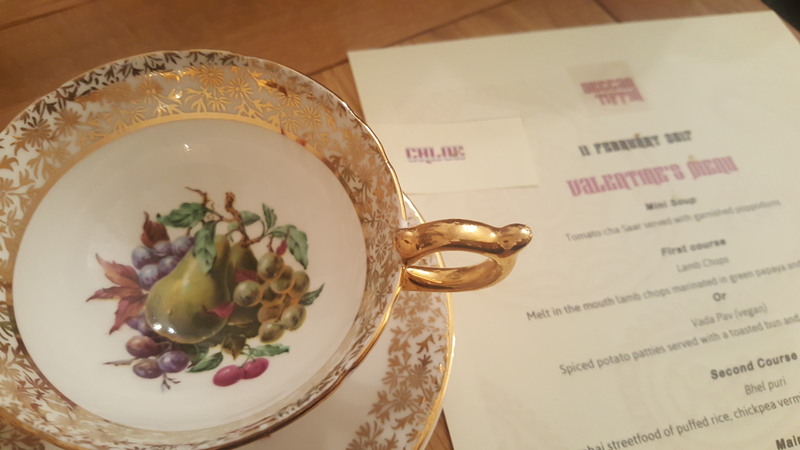 I was luckily invited along to one of Deccan Tiffin’s supper clubs which was Maharastrian themed food on this particular evening. 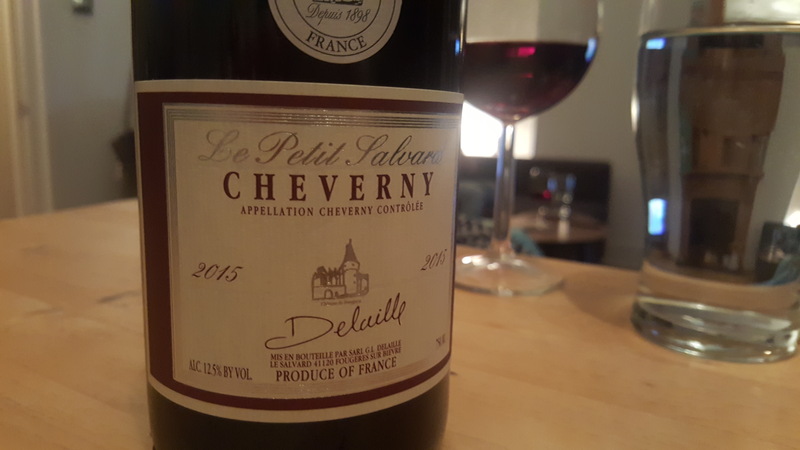 As it was quite late I went to a friend’s for pre drinks and bought this lovely tipple from Seven Cellars in Seven Dials, one of my favourite wine shops in Brighton. It was really lovely, easy to drink and around £12 so a steal! The food was incredible, definitely some of the best Indian food I have ever tasted I was blown away! The mackerel curry was a highlight for me, it was the dish I was looking forward to the most and it exceeded expectations. I won’t go into full detail as I wrote a review which you can read here to get you inspired. Priya is running another one on the 8th of April and I think I’m going to book onto it, you can follow this link for tickets and the menu. This time it’s £30pp and the main event is goat curry which I have to try! More of that soon. 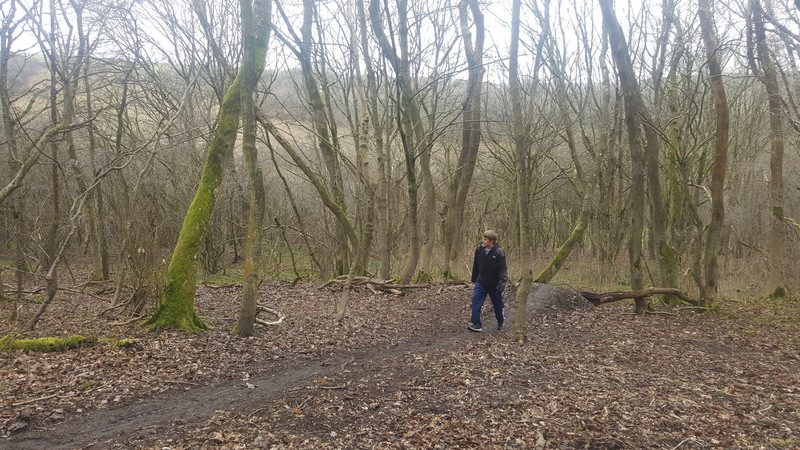 As I mentioned earlier, I have really been enjoying getting out into the woods and countryside and exploring each weekend. At the end of the year, Daz and I are going to be leaving the UK on an adventure to travel by train through Siberia and Mongolia where this is going to be lots of trekking involved. I want to make sure I am up for it but also there are so many beautiful places surrounding where we live that we are just waiting to be explored. The top two pics are of Wild Park which is near to opposite our house in Brighton. 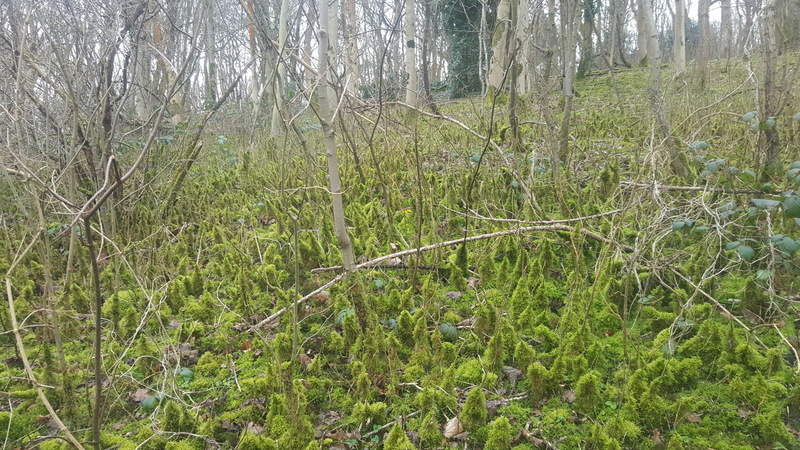 The woodlands are stunning and ‘wild’ and there are lots of different tracks to explore. I would really recommend heading out here one weekend to walk around, you can take the 25 which leaves from Palmeira Square and costs £2 one way (I think £4.70) for a day saver. From Elm Grove this bus takes 10 mins, it’s really not far! We also went to Stanmer Park over another weekend and made the most of the Winter sun. On the way back we walked through the woods along a path that runs alongside of the road back to Coldean Lane and found a field with lots of red plants. 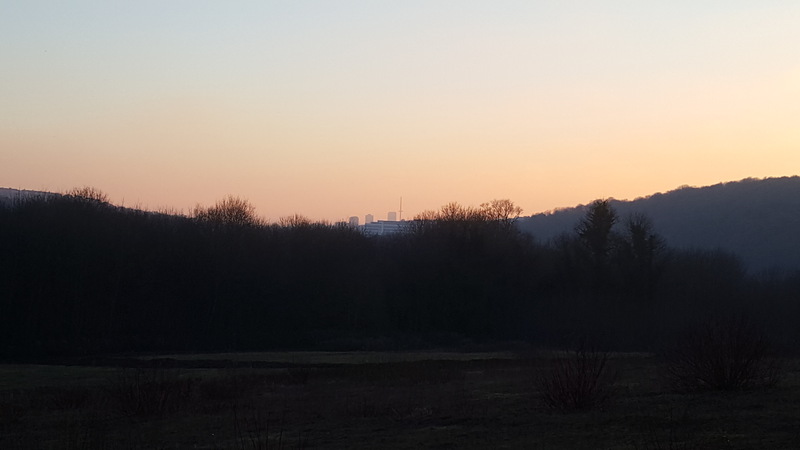 We walked through the field to the top of the hill and saw this view and sunset which at the moment is my favourite view of Brighton. Pretty cool innit? Okay sorry for this one it’s a little bit of a mushy food pic and might not look appealing but it was awesome! It was another Pressure Cook Recipes recipe, this time beef chilli and I’m salivating thinking about it. 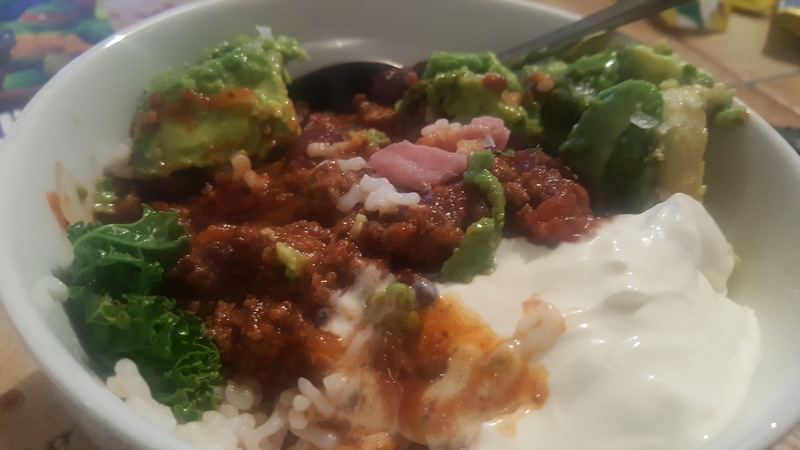 This was leftovers with avocado, Konjac Rice , sour cream, bacon and kale. You really need to try it. One of my colleagues and friends at work Kate is a devout foodie like myself and also happens to be from Ukraine. She had been saying she would have me round for dinner one day to cook some traditional Ukrainian food and it finally happened. I was super excited! The pic above was the feast she prepared – we started with ‘red soup’ or Borscht that she simmered on the stove top for several hours with chunks of beef with bones for maximum flavour to develop in the stock. 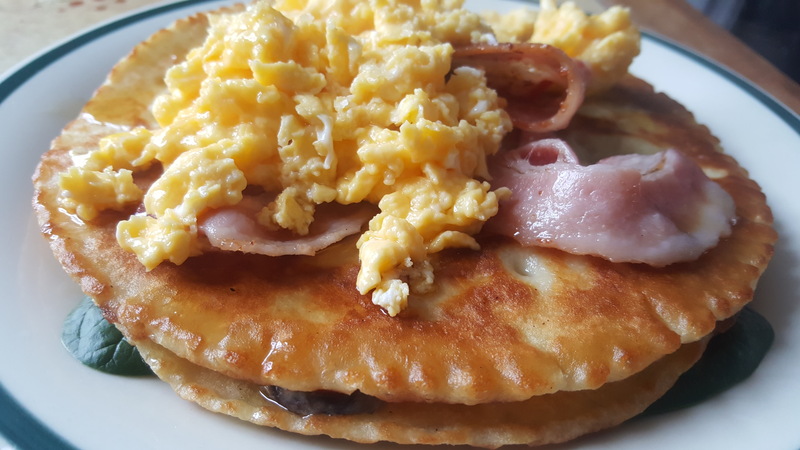 It was also pancake day in the UK (Shrove Tuesday) around this time, as well as pancake week in Ukraine where everyone makes pancakes all week to celebrate the last week before Lent. 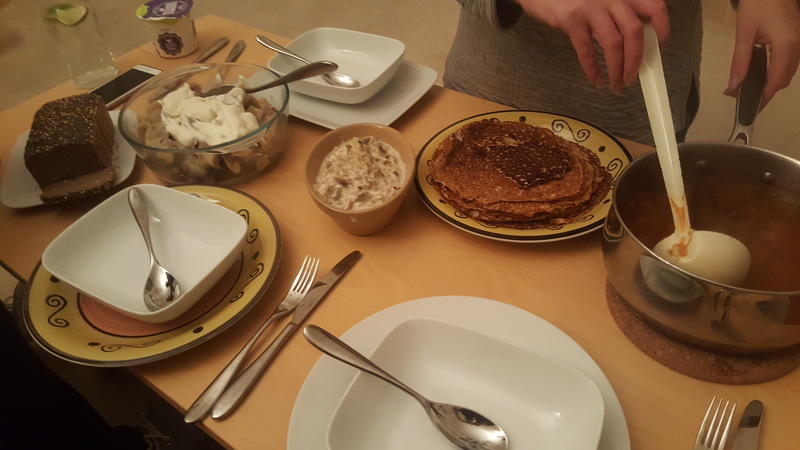 This is why we then had buckwheat pancakes made with kefir yoghurt with a creamy herby mushroom filling. These were so good and I would highly recommend as a savoury pancake batter. There were also cherry dumplings using sour cherries as the filling and she kindly made them gluten free for me. I helped steamed them in the Instant Pot as she bought one at the same time as me. For dessert, Kate made a honey cheesecake (also gluten free) but as she tried to use less sugar for me and no flour it didn’t turn out as she hoped. I think it still tasted good! After Kate’s delicious pancakes I was inspired to make my own gluten free version using the flours I had at home. I used an egg, rice flour and Doves Farm gluten free plain flour then mixed it with oat milk too. They were lovely and crispy, not so light and fluffy but really good for savoury pancakes that I love. The pancakes pictured above had herby mushrooms, spinach, egg, bacon and maple syrup. Really filling but it kept me going for the day! 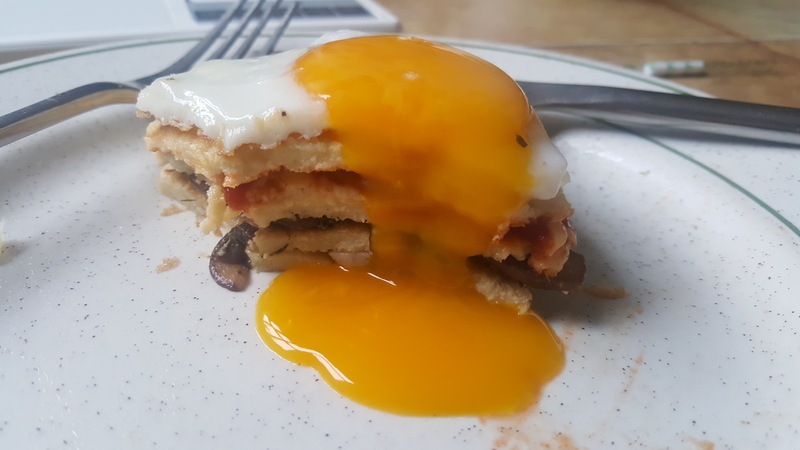 These are just here for your yolk enjoyment, this time they had salsa, mushrooms and a fried egg that I couldn’t resist taking a pic! Thanks again for reading, I will try and get the March one up sooner as there have been some good food times this month which you may have already had a peek into based on my previous reviews! I have a few new places in mind in Brighton that I wanna check out so I will try and get some more reviews or Instagram posts up soon. Happy Spring!